Explore the latest code and design standards for wood-framed exterior wall assemblies that support energy optimization and durability in buildings. Assess the various product approaches to meet air barrier and water-resistive barriers (WRBs) on the market today for green and sustainable buildings. 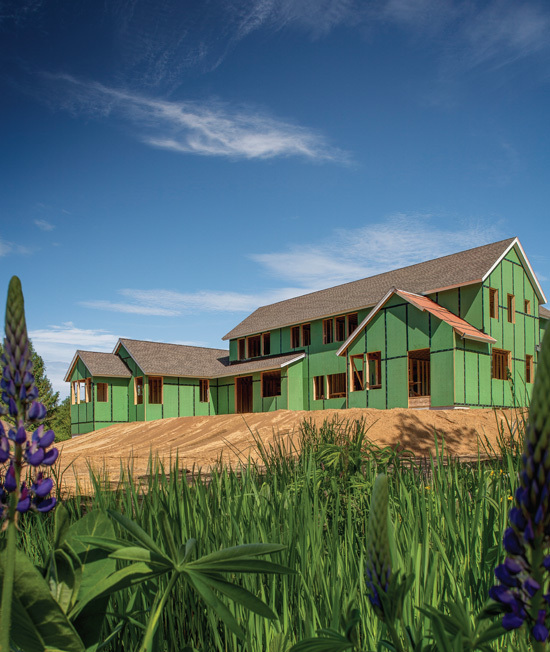 Analyze the differences between multi product solutions and single-product solutions to wall sheathing for a total approach to green building design. 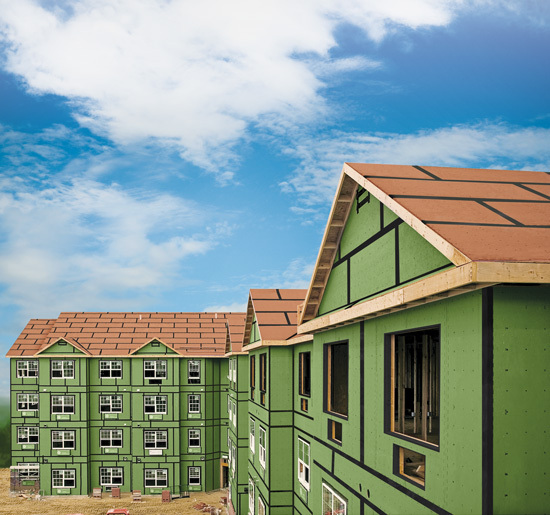 Investigate the benefits of continuous insulation added to exterior sheathing as a means to optimize energy performance in wood-framed buildings. Wood-framed construction has been, and continues to be, a very popular construction choice for single-family residential, multi-family residential, and light commercial buildings. Building codes and energy codes recognize this popularity and have incorporated requirements that apply specifically to wood-framed buildings. These codes have evolved in recent years with an increasing emphasis on building envelope performance related to five key areas—namely structural integrity, water resistance, air tightness, vapor control, and thermal resistance. The common design and construction response has been to find available products and materials that can address each of these five needs independently. This approach requires multiple layers of materials acquired from different manufacturers with separate installation steps for each. However, manufacturers have also begun to offer products that can combine multiple performance requirements into a single manufactured product or system. Design and construction professionals have come to understand that these integrated products can provide greater on-site quality control while providing a faster, more labor-efficient means to meet code requirements. Evolving codes increasingly emphasize building envelope performance. Structural products offering integrated layers of protection against moisture, air leakage, and thermal bridging are now available to add quality control on-site, while meeting multiple requirements. Historically, as is true today, the applicability of a particular code or specific requirements starts first with a determination of the basic building type. This is essentially determined by the way the building is used or occupied and to some extent on the size or construction type. Residential buildings are treated differently than commercial buildings under the codes, and high-rise buildings are treated differently than low-rise buildings. While the categories of code requirements are similar between these different types (i.e., fire safety, light and ventilation, energy usage, etc. ), differences exist in the minimum or threshold levels of performance among the different building possibilities. The International Code Council (ICC) is an association of government, corporate, and individual members who together form the largest building and safety code organization dedicated to protecting the property, health, and safety of people worldwide. It is dedicated to developing model codes and standards used in the design, build, and compliance process to construct safe, sustainable, affordable, and resilient structures. Most U.S. communities and many global ones have adopted some or all of the family of International Codes (I-Codes) published by ICC. These I-Codes are a complete set of comprehensive, coordinated codes that address general building construction, fire safety, mechanical systems, electrical work, energy efficiency, and related issues. Together, they provide a common platform and format for a coordinated approach to create regulatory requirements for the construction and maintenance of buildings. Because of their widespread use, I-Codes will be the basis for the discussions in this article, recognizing that application of these codes vary across the county due to publication year and adoption rates. Further, specific building types will be linked to specific codes as follows. Single-family or duplex homes, whether free-standing or attached as townhouses no more than three stories above grade, are specifically covered under the International Residential Code (IRC) for One- and Two-Family Dwellings. This category of buildings is fairly easy to define, and the distinctions between them and other types of buildings are reasonably well understood, so it is not surprising that there is a separate treatment for energy efficiency in one- and two-family homes compared to other buildings. The International Energy Conservation Code (IECC) is the document that addresses such energy efficiency with two separate and distinct parts—one for commercial construction and one for residential construction. Since people can occupy residential living units that are not one- and two-family dwellings, those occupancies are treated under the more general International Building Code (IBC). Specifically, the IBC identifies four categories of Residential Occupancies in Section 310: R-1 for transient residents (hotels, boarding houses, etc. ); R-2 for permanent residents (apartments, dormitories, vacation properties, etc. ); R-4 for between five and 16 permanent residents in a supervised residential environment; and R-3 for building conditions not otherwise meeting the definition of R-1, R-2, or R-4. One thing to be attentive to: while all of these building types are commonly considered commercial buildings for residential use, the IECC doesn’t make distinctions the same way. Rather, for purposes of the IECC, a residential building includes not only detached one- and two-family dwellings (including townhouses), but also any Group R-2, R-3, or R-4 building that is three stories or less above grade. The significance of this distinction is that the residential provisions of the IECC are more stringent than the commercial ones in terms of the building envelope. Hence, while all R-1 buildings and any R-2, R-3, or R-4 buildings over three stories can use the commercial portions of the IECC, those other than R-1 at three stories or below need to comply with the residential portions of the IECC. All buildings that don’t fall into the scope of the IRC come under the provisions of the IBC for new construction. Existing buildings that are being repaired, altered, or added on may be subject to the International Existing Building Code (IEBC), which allows for some accommodation of existing conditions provided all new work complies with the IBC. Both of these codes require compliance with the commercial portions of the IECC, and both indicate when wood-frame (Type 5) construction is allowed or not. With an understanding of the differing applicability of the I-Codes on various building types that can use wood-framed building envelopes, let’s turn our focus to five specific characteristics required by the provisions of these applicable codes. Wood-framed construction has been and continues to be a popular construction choice for single-family, multi-family and light commercial buildings. Codes continue to evolve to address structural performance, moisture, air, and thermal management in the critical exterior wall assembly area.